A tooth with severe damage can compromise your oral health. To prevent extensive decay and save your tooth, Dr. Lalonde may suggest a crown. Also called caps, crowns fit securely over the teeth and cover more surface area than fillings. Depending on the tooth location, we may use all-ceramic, porcelain-fused-to-metal, or gold materials. If you're self-conscious about cracked, broken, decayed, or worn teeth, we can bring back your healthy, natural-looking smile with dental crowns, also called caps. A crown can return structure, strength, and function to a tooth with extensive decay or damage. Designed to fit snugly and function as a healthy tooth, a crown will protect your tooth from further damage and preserve the jaw's correct natural alignment. Typically, it takes two visits to prepare for and place a crown. First, Dr. Lalonde creates an impression of your tooth and places a temporary crown. He sends this information to the dental lab so they can mill the crown. At the next visit, he will make any adjustments necessary and place your permanent crown.We use precious metal, porcelain pressed (or fused) to metal, or all-porcelain crowns. To maintain a fully white smile, we recommend all-ceramic crowns. Our precise color-matching system allows us to find the right shade of porcelain to blend with your natural tooth color. Porcelain crowns are also extremely durable and long lasting, and these benefits make them popular with dentists as well as patients. Learn more about crowns in our patient library. 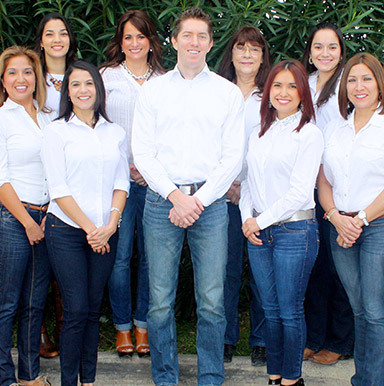 Call our Los Fresnos dental office to schedule your appointment with restorative dentist Dr. Lalonde. We welcome patients from Port Isabel, South Padre Island, Brownsville, San Benito and Bayview.